Serbia has agreed to water down its controversial resolution on Kosovo due to be presented at the United Nation's General Assembly on Thursday. The European Union's top diplomat welcomed the decision. After weeks of diplomatic pressure from European Union nations, including Germany and France, Belgrade indicated on Wednesday that it had struck a "compromise" with the EU on a joint text for a resolution at the United Nations General Assembly. It no longer directly challenges Kosovo's independence. Serbia also agreed to a call for a "dialogue" with Kosovo. 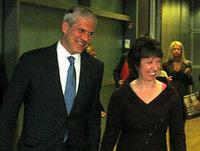 German Foreign Minister Guido Westerwelle welcomed Serbia's decision. 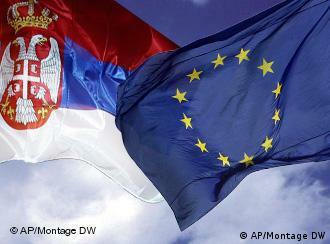 "This is a clear signal that Serbia sees its future in the EU," Westerwelle said. "I call on all parties to begin these talks rapidly... and lead to concrete results for the people." The EU's high representative for foreign policy also reacted positively. "I warmly welcome the announcement," Catherine Ashton said in a statement. The move was seen as bolstering the EU's mediating role in the region. "This draft resolution will now be a resolution put forward by 28 European countries," Ashton added. "All 27 EU member states and Serbia will be co-sponsoring this draft resolution." In the new text, Serbia has dropped calls for the condemnation of Kosovo's unilateral declaration of independence and for renewed talks on Kosovo's status. In July, the International Court of Justice ruled that the declaration of independence violated no international law, and welcomed "the readiness of the EU to facilitate the process of dialogue" between Serbia and Kosovo. Serbia also agreed to move the venue of talks from the UN to the EU, where 22 of the 27 member states have recognized Kosovo as an independent country. Serbian President Boris Tadic said in a statement that the resolution defends his country's interests "by peaceful and diplomatic means." He added that Belgrade was acting "on an honest wish to resolve all issues in a partner ship with the EU and other important international players." However, Serbian nationalists and Kosovo Serbs have sharply criticized the compromise. The opposition Democratic Party of Serbia described the move as a "capitulation to ultimatums from Western powers and confiscation of Kosovo." Analysts believe the diplomatic bargaining has recognized the EU as the key player in possible talks between Belgrade and Pristina. Ashton met Tadic late on Tuesday in Brussels, with a breakthrough coming on Wednesday. Serbia is keen to become a member of the European Union, but questions remain over its stance on Kosovo. Kosovo declared independence from Serbia in February 2008, 11 years after NATO ousted Serbian forces from the region, ending an ethnic conflict. The new country has been recognized by the United States and most EU nations. Serbia had originally planned to use the UN resolution to challenge Kosovo's unilateral declaration of independence. The new draft was due to be presented later on Thursday. German and British foreign ministers warned during recent visits to Belgrade that the country was risking its ties with the EU by focusing its entire diplomatic efforts on the issue.